I have to say that there are some differences in Christmas traditions in my country. First - gifts are opened in 24th - Christmas Eve and it's done by randomly picking some gift from under the Christmas tree and then, the person who's name is on the package must make some sort of performance to deserve the gift. Usually it is to tell some short Christmas poems. So tags on gifts are very important and as I still don't know to whom I will be giving these tags, I left the name spot empty. This is the tag I like most. Background shape is cut with my Silhouette (and inked with Broken China and Faded Jeans Distress Ink) and then I cut the same shape from plastic material from a packaging for a doll and embossed it with Tim Holtz Alterations Damask Texture Fades. They do make such a deep impression. 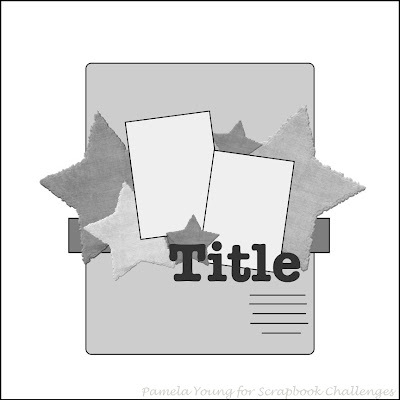 Next you could say that I've used Spellbinders Labels Ten Nestabilities and Fancy Tags Shapeabilities, but it truth I just traced those shapes in Illustrator and cut with my Silhouette. Both were dry embossed by hand and then tag was spry painted with gold paint and oval label was inked with Faded Jeans Distress Ink. Next I used some star brads coloured with gold paint to match little cherub. Next I used some matching blue ribbon with golden accents and a grommet. From this tag I do like the middle part a lot. The label on top was made again in illustrator combining some ideas taken from these stamp sets: WaltzingMouse Holiday Labels No 14, Very Vintage Labels No 4 and Nina Bracket a Lovely Labels 2. Next I cut the second label using the largest die from Spellbinders Labels 4 and self printed paper. Next I tied green ribbon bow using my self made Bow Easy and strung some beads on headpin. Background is simply cut from green card and embellished with dots of Marabu Metallic White Liner. Again I used brass grommit threded through with dark red ribbon. I took my white cardstock angel and dryembossed on a simple mousepad with a small stylus (mine is from Fiskars included in Mini Shapeboss Starter Set) from front to make some creases in places they would naturally be. Then from the back side I embossed all large areas with a large stylus (I use the one included in Fiskars Tool Taxi). Then I did some shading with a blue chalk from my Pebbles chalk set. The card itself is made from a white card blank and covered with a blue card embossed with Spellbinders Snowflakes Impressibilities covered with Broken China Distress Ink, using BigShot. Lower edge is then punched with Martha Stewart Edger Punch Snow Flurry. And over this snowflake edge I placed some white lace with staples on each side. Matting is done with page torn out of actual book for singing with notes and some golden shimmering cardstock again embossed with the same snowflakes impressibilities and punched with the same Snow Flurry punch around the page punches. Final touch is made with a dotted blue ribbon and some glass star with a blue rose inside. 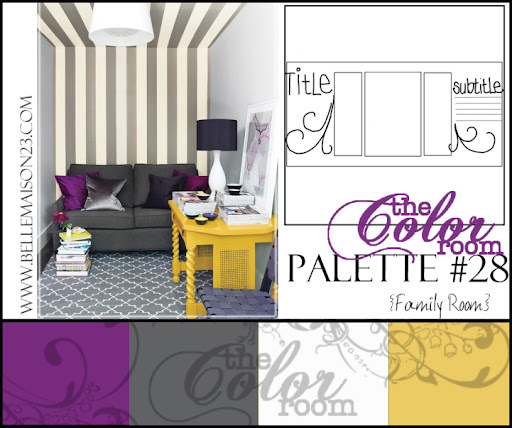 Another wonderful colour challenge from thecolourroom.ning.com. These folks really know how to make scrapping most interesting time. This is me in my yard, after a very eventful day - first I made some decoupage on fabric and then I had to wash my girls after they had painted themselves all over with finger-paints (sure gona make a layout out of that). Photo was taken by my sister-in-love Baiba. First I inked edges of my basic 12x12 card with Black Sooth Distress ink. Then I inked slightly smaller card with Mustard Seed and slightly with Chipped Saphire. Next I die-cut large floral sticker and dark gray title with my SDSilhouette. Matt is also made out of basic card with Black Sooth inked edges. Last I added some bling to brighten up my LO a little bit! Last week we had a crop about prick and stitch patterns and spirelli wheels. I decided to make this cute skating snowmen card. I used pattern found in Stitching Cards site. I used some batik blue crochet string for stitching snowmen, red muline thread for their scarves, simple orange sewing thread for buttons and carrot noses, silver thread for skates and snow and finally black crochet thread for eyes and mouths. For eyes I made small French knots, for a 3D feel. As previously stated there are so few thing we can buy here in Latvia. I've always been very practical (hope so), I try to make my own tools to work with and today I want to share a clear ruler and paper edge distresser tools which I've made recently. I lost my metal ruler some days ago and really hope to find it soon, but in the meantime I found this clear plastic ruler in my local shop. It costed only about 0,50 dollars and I got an interesting idea. Well it is naturally that I can't use this ruler for cutting but that's what I mostly use a ruler for. I knew I had a very thin and long metal ruler at home whom I never use, as it is so thin that it bend and I'm not able to get straight line. So I cut my ruler to fit the size of my new plastic ruler and adhered it to one side of it with a super glue. Now I have clear ruler to see through for better aligning and a metal edge to cut with!!! 3. With a craft knife or other sharp blade try to make room between segment edges for three parts of a craft knife blade to be tucked in. 4. With a little help of flat nose pliers I finally tucked my blade almost all the way in and secured all this sandwitch with a super glue. As promised in my previous posts, I want to share with you a pictures of my latest purchase of ribbons and laces. Oh this was such a fun (I do say that often isn't it?). Our latest crop theme was embossing powders and what to do with them, so I'm going to post some more techniques used, but I wanted to start with this Cracked Glass technique, which is wonderfully explained in Gina K video on StamTV. As I still don't have UTEE which is best for this technique, I used my A La Mode clear embossing powder from Hampton Art - I have three sets - metals, pastels and basic colours, where there are 16 different colours in each set, because most of all I value quantity and price :) For this small square I used about half of bottle, but I do like the effect of cracks. I really wanted to go for a wintry card, as I think I'm now slowly switching to Christmas mode :) and this Tilda image is just so wonderful. All the inking was done with my Distress inks - Faded Jeans, Stormy Sky and Broken China. 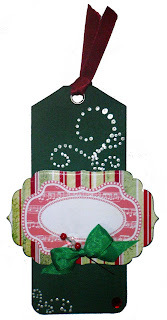 Polka dotted paper is from latest issue of PaperCrafts Inspirations magazine and you can download it for free. Border was punched wit my Fiskars Effervescence Border Punch. For some very special project which soon should be finished and most certain I will tell about that in this blog, I had to make things in macramé technique. I did this for the first time and basic instructions came from free-macrame-patterns.com. I did some changes - basically for the size of it and finishing steps. It took me only about 1,5 hour of work, but I'm not sure that it could become my new favourite craft - paper crafting and decoupage still are my No 1! I thought that I would not make it in time, as with my kids being sick and getting a balloon blow-up hard in my left eye (it's already second day but it still hurts), but somehow I did it. Maybe it's a bit rushed, but I really tried to follow Irma's inspiring journalling to make this page meaningful. "My heart has three keys and you own one of it. This magical key hides in your smile, your kisses and hugs. It hides inside of yourself - in all your essence and existence. Your every heartbeat is one turn of this magical key. Mos of all it may be felt in such moments as this one - when my little child painstakingly trusts me her achievements and gives me her love." Well of course I used again patterned papers from K&Company but this time, or rather today, I got two new paper pads: Susan Winget Nature 12x12 Designer Paper Pad and Brenda Walton Madeline 8.5x8.5 Paper Pad. Actually I got also a third one - Amy Butler Lotus 12x12 Faded China Paper Pad, but this one still has to wait untill it's going to be used. I think I have had the best heritage any crafter could have, because this old looking lace, really is very, very old. Actually I have no idea how old it is but it came again from may great-grandmothers closet after she passed away at age of 101 and a half. If I haven't mentioned that before, her name was Aleksandra and I named Aleksa after her - I just didn't want anyone to call her Sasha (as Aleksandra is a Russian name and that's the way they diminish this word), so shortened it a bit. By the way - those small red flowers also came together with the lace and many other interesting crafty items. Now most often I use paper flowers from Woodware and secure them and my big key hole with small and large brads from DoveCraft. We used a tutorial from scrapbook.com - And Then There Were Four. 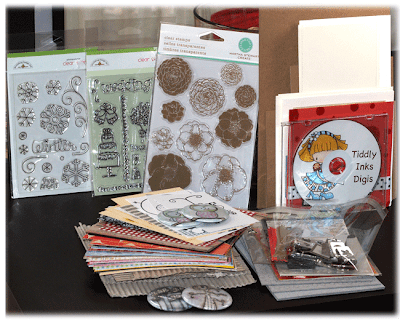 As there are so small possibilities to buy scrapbooking products in Latvia, I had to show how we can make the same thing with different products or techniques. This is Emilia in our backyard pool really enjoying this very hot summer (jippy - this hot we hadn't had for some 10 years I think). I used my all time K&Company patterned papers and the only chipboard shapes we actually CAN buy here. Girls were given this frame to trace around and cut from another piece of card, but I coloured mine with light blue acrylic paint. For my title I had die cut with my SDSilhouette a transparency (actually it doesn't cut it very well, but it is easier to trace line with a craft knife afterwards) full with letters to use as stencil. I used AG Stencil font downloaded for free from dafont.com. You can download these die-cutting files a the end of this post. Letters were painted with acrylic paint (I actually wanted to use the same blue colour, but somehow remembered that just after painting, so I did some little shading with blue and yellow watercolour pencils). Small lettering was done with my white opaque Jelly Roll pen. There should also be numbers, but I will skip that. Theough I will ad a date strip somewhere near my title. I made this layout some time ago, but just wasn't able to photograph it normally - really I tried that about four times, but all I was able to get was a reflection of a flash light or blurr. But finally I got it almost normal to show you :). This is a LO done again for scrapbookchallenges.ning.com and their sketch #218. Pictures were taken in mu husband's granny's garden and they show my Aleksa and her aunt Betija - yes aunt, but she is just 3 years older than her :). It just happened so that they were dressed very similar, but it does look great, especially against that wonderful green of grass and bushes. I could not come up with an appropriate title for quite a long time, but then thought that well - they're just stylish babes having fun! I used some patterned paper with butterflies and flourishes from some unknown manufacturer (well - at least not known for me). Pink scallops were made with my Fiskars Embossing Border Punch - Scalloped Daisy, but blue border with Effervescence Border Punch. Naturally title is cut with my SDSilhouette from very bright pink 160gsm card. By the way, if I havn't mentioned, mostly my single coloured 160gsm papers come from Clairefontaine Trophee assorted pastel colour and intensive colour packs. Ribbon is bought in our local Abakhan shop and is just the perfect match for pink in girls's clothes. Journalling was done on a bright green card with pink opaque Jelly Roll pen. I also added some dimensional flower stickers, but I'm not sure where they came from. I'm in love with Tilda (I hope everyone knows that Tilda is just a stamp from Magnolia and not a real woman :) and it is allways such fun to make cards with her. I do love colouring and hope to own Copics one day, but untill then I use my watercolour pencils. This was even more fun to make, as I used some very not common tricks for the Tilda's panel. First I stamped my sitting Tilda on white card-stock and scrap paper using Black Sooth Distress ink (all I had with me), I cut out Tilda from scrap paper ad adhered it on my real Tilda using some repositionable adhesive. Then I stamped bench aligning it so it looks like Tilda is sitting on it. As I mentioned before, Tilda was coloured with watercolour pencils - the ones I use is from Milan and Koh-i-nor. Milan's are more easily blendable but less saturate and Koh-i-nor's are more pigmented but harder to blend. 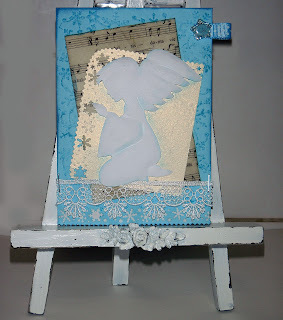 I do own a BigShot but currently with only one Nesties die set and even if I would have more die cut shapes, they would be in my home in Riga, but this card was made while I was visiting my mother in love. Usually when I need a die-cut shape, I find an object of proper shape and size, trace it around and cut out using scissors. This time was no exception and I raided the house for some proper sized round objects, but instead found this octagonal shaped sugar tray lid which looked so nice, that I decided to use it. I knew I wanted to make some inking on edges but with a slight white border (the effect usually done when paper is cut using Nesties), so I cut my real shape and drew around it on a scrap paper. Using a ruler I drew bit smaller shape inside my original shape and cut that inner part out - I made a mask for my border. Using some temporary adhesive I adhered my mask to real shape and inked all around edges using Broken China Distress ink. Background papers and metal brad* as usual are from K&Company. Sentiment is ment for a birthday but it says "Lots of Happiness" and is my own stamp. Blue background and sentiment is inked with Faded Jeans ink and main background with Walnut Stain. Lace is from my favourite shop I discussed in my previous post. *Sorry - brad is from DoveCraft and not K&Company! I had some sudden wish to make cards using my poppy stamps. I made both of these cards for Waltzing Mouse sketch challenge and yes, they both are from one sketch. 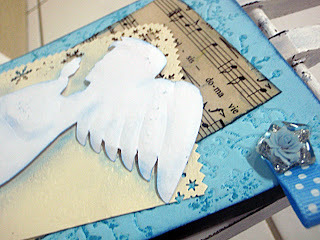 For the background, I used my own old script stamp, which was stamped with TH Distress Vintage Photo ink. Some inking was done with Torn Lipstick, Tea Dye and Walnut Stain inks. Sentiment and bracket label is jet again my own stamp and it says - Just Because. Poppy stamp is a clear acrylic stamp from Germany company Rhyer, but I found out that it is available as a digital image as well. Image is little shaded with watercolour pencils. 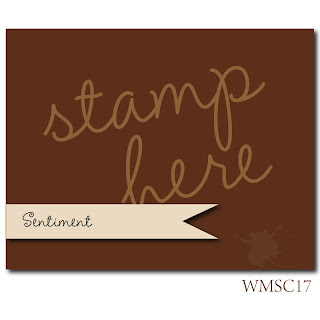 Both - poppy and sentiment are stamped on one of my K&Company paper with a little inking with Spiced Marmalade and Walnut Stain inks. Lace ribbon is from local store and dew drops were ordered from e-bay. This card uses the same patterned paper as above (both it's sides) and same inks. Only this time poppy image is from Creative Impressions "Poppy" stamp and is lightly inked or rather you could say coloured with Spiced Marmalade and Bundled Sage inks. For inking and also colouring I use my Tsukineko Sponge Daubers for stenciling - I do love them and last week bought another set of tem to have enough if I would use more colours in one project. Sentiment again is my own stamp and it says "I appreciate everything you do". Lace is from the same shop as above - I really like that one, they do not have lot of choice, but all what they got fits me :) I think I will make a post showing beauties I just purchased. And this little flower brad is also from K&Company. "Sometimes, after a hard night with my kids, I bring my youngest daughter to my granny and say to look after her, so I could go working, but instead I hop into my bed and have a nap". For this layout I used some of my previously mentioned K&Company papers. Border is made again by cutting bracket template and then repeating it around edge. Bed is actually a cutout from a magazine and I just added some corresponding colours from the bedspread by inking area around bed and attaching Woodware paper flowers with K&Company various brads. Also I've used chipboard flower images which came with my PaperCrafts Inspiration magazine. I drew some pencil swirls and added dots to them using copper metallic marker. If anyone knows how other people got their pearl swirls on their LO's I would pleased to her, as I refuse to believe that they just add each pear separately. This was such nice sketch and it was really fun to make this layout. 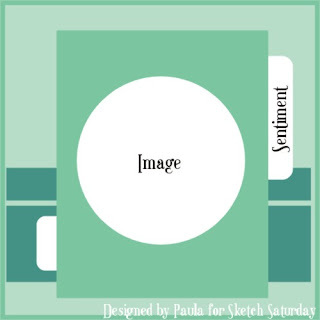 Sketch is from scrapbookchallenges.ning.com. The background was printed using patterned paper design which I downloaded free from Shabby Princess. 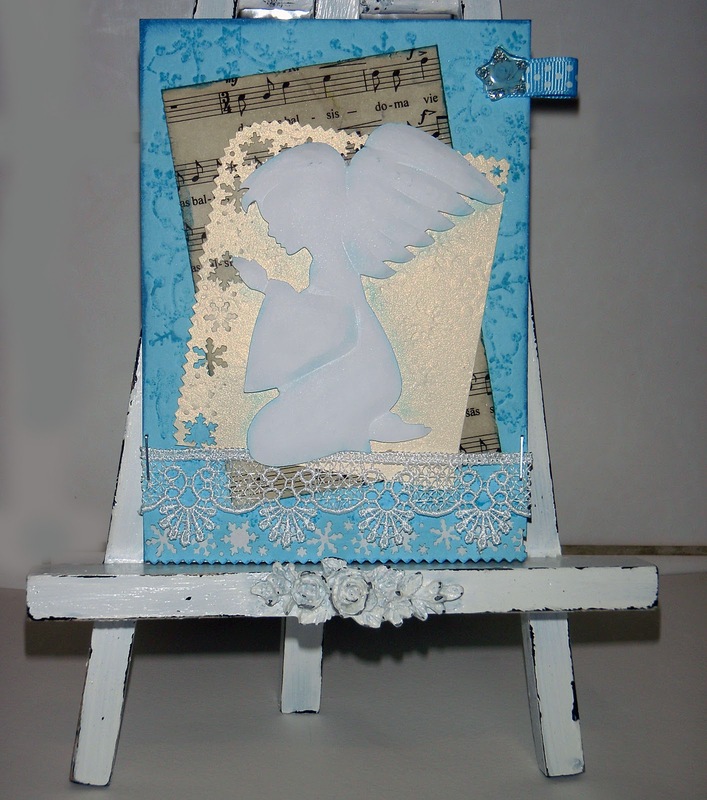 Smaller background was made using some pale blue card and a white napkin glued using decoupage medium. Napkin makes creases which remind me of ice and snow. Both backgrounds are inked using Broken China and Wethered Wood Tim Holtz Distress Inks. Snowflakes and title were cut with my SDSilhouette from white 160gsm card. Afterwards I inked them with Broken China, Spun sugar and Faded Jeans inks. For inking I used Tsukineko sponge daubers for stencilling - they are so tiny and I can stick my finger in them, so it makes very easy inking. Journalling is again done with my Gelly Roller sparkling blue pen.